Welcome to Saint Dominic’s Parish Church for the Sunday Holy Mass celebration. Today we honor the birth of Saint John the Baptist. 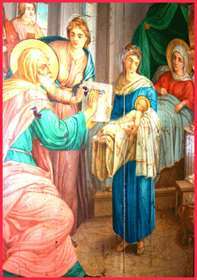 The saint was called by God from his mother’s womb to be the forerunner of Jesus Christ, our Lord and Savior. He fulfilled his mission of a witness to the saving truth of Christ by shedding his blood. We pray to the Lord for the blessing of faithfulness to Him to the end after the example of Saint John. There will be not only great love and care but also priceless recompense for God’s faithful servant beyond expectation. Saint John was mentioned in the preaching of the Apostles as the messenger whom God sent to prepare the way for Christ the Lord and Savior of the world.